Power Up: Master Your Blood Sugar is a life-changing eBook offering holistic solutions to achieving optimum blood sugar levels. What we don’t know won’t hurt us. Or will it? Over 100 million North Americans have been diagnosed with diabetes or prediabetes, and another 30 million have it but don’t yet know it. 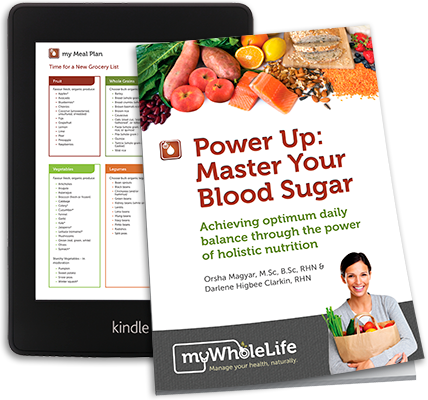 WholeLife Holistic Nutrition Inc. proudly announces the publication of their first eBook, Power Up: Master Your Blood Sugar, to address this steadily growing global epidemic head on. Orsha Magyar and Darlene Higbee Clarkin developed this eBook to bring positive change to the lives of people who struggle with blood sugar issues or type 2 diabetes. One of these was Darlene’s father. He battled type 2 diabetes for over a decade, and his death from the disease affected Darlene profoundly. She saw that her own health was heading down the same path, and she realized that the power to change was in her hands. She began studies to become a Registered Holistic Nutritionist (RHN), and her instructor Orsha became her collaborator. Darlene’s experience in business and technology was a perfect fit with Orsha’s extensive expertise in nutrition and neuroscience. As co-founder and Chief Technical Officer at Points.com, Darlene had a hand in inventing the state-of-the-art loyalty commerce platform that Points.com uses to this day. With this background and Orsha’s extensive scientific experience, she knew they could build something extremely different and unique. To get nutritional information to the public, while keeping it easy and affordable, she founded WholeLife Holistic Nutrition Inc. They began building apps. Orsha drew on her profound scientific knowledge to create the content, and Darlene contributed her input and passion to craft the apps’ look and feel. In 2012, the Blood Sugar app was chosen “My Favourite Find” at the Canada Natural Health Awards. Power Up: Master Your Blood Sugar is the definitive next step. This comprehensive nutritional guide, developed from leading-edge science, identifies top blood sugar-friendly foods, foods to avoid, supplements, and lifestyle suggestions. And most importantly, it features a complete meal plan to guide you to optimum daily balance. Through holistic nutrition, this must-read eBook gives you both the tools and the knowledge you need to achieve and maintain healthy blood sugar levels. Available for Kindle on Amazon, nook by Barnes & Noble, iBooks by Apple, Kobo, and Copia. Click here to purchase today! myWholeLife combines leading medical research, holistic nutrition principles, and innovative technology to offer personalized health programs through online services and apps. The goal is to broaden public access to the knowledge and support of holistic nutritionists and related professionals, working in cooperation with medical practitioners, to bridge the gap between holistic nutrition and Western medicine.